When I think of Spongebob I am reminded of the latest report out that says watching him makes you dumber. 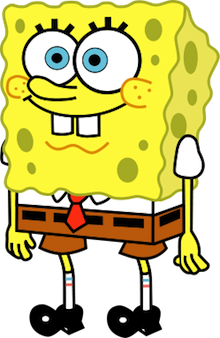 You would think it would be hard to learn lessons from him, but I have found that Spongebob has quite a few great characteristics that kids can glean from him. Always think positively. Spongebob is a true optimist, seeing the glass as full. Even if it is just full of air. He always has a smile on his face and has a great attitude about most things. It is really hard to get him in a bad mood. Work hard. No matter what obstacles you face. Spongebob loves his job and works hard at it. He does his best to work hard and make his boss happy. He also thinks it’s important to keep the customers happy. He has difficult coworkers, boss, and customers. Despite all that he works hard, with a smile on his face. Think the best of everyone. Spongebob is always happy to meet a new person and make them his friend. They can treat him bad, but he still gives them the benefit of the doubt. This quality is probably what helps foster his positive attitude. If at first you don’t succeed try, try again. Spongebob in his optimism isn’t capable of thinking he can fail. So, if he does, he just picks up where he left off and tries again with an attitude of winning the race. He may have to try 38 times but he keeps coming back with a smile on his face and a great attitude. Cheer others on. Spongebob enjoys watching others succeed. It doesn’t matter if he’s in the sidelines or competing against them, he just wants the best for them. Who wouldn’t want to be friends with a guy like that? Don’t be afraid to be yourself. Spongebob never feels the need to impress others or be a people pleaser. He knows who he is and likes himself. If you don’t like him, he doesn’t seem to notice. He just keeps seeking to be your friend. Sing a song to change your outlook. Sometimes when Spongebob is in a bad spot with no seeming hope, he makes up a song. It cheers him up and he hopes to help the others around him have hope. He thinks it will make the situation more durable. Adding some drum sounds and different voices makes it even better. How to be a good friend. Spongebob is always there for his friends no matter what it costs him. He is always compassionate and concerned about the feelings of his friends and what will make them happy. Honesty is the best policy. Spongebob sees importance in being honest. He wants to be truthful to his customers, boss, friends, and strangers. If he isn’t, he is haunted by the guilt and the truth comes tumbling out. Always be willing to help others. Whether your Spongebob’s best friend, co-worker, or just a fellow ocean dweller, he is always willing to lend a helping hand. He never grumbles, even when excessive demands are put upon him. If you let your kids watch Spongebob there are many lessons they can learn from him. He has many great characteristics that would be good for any child to have.